The interest for conjugated systems, which particular photo-physics characteristics emanate from the existence of a cloud of π electrons delocalized, is coming among others from the possibility to incorporate them as active components in a large range of optoelectronic devices, such as organic light emitting diodes , solar cells or photovoltaics , field effect transistor , and (bio)chemical sensors. This sector, also called plastic electronics, is growing today by leaps and bounds. Even if these discoveries have been applied to concrete commercial applications, a lot of questioning remains about the principle of functioning of those devices and about the photo-physics properties of conjugated materials. Consequently the full potential of those materials and devices has not been exploited yet. In previous studies, we investigate with a combination of ab-initio, semi-empirical and micro-electrostatic calculations, the case of the Pentacene – Fullerene heterojunction [4,5]. This kind of system is characteristic of the interface used in solar cells. We have studied the charge separation at the interface, i.e. how a negative charge (on the fullerene) and a positive charge (on the pentacene) will leave the interface and migrate trough the bulk. We also focused on the interface dipole that can drive the charge separation. 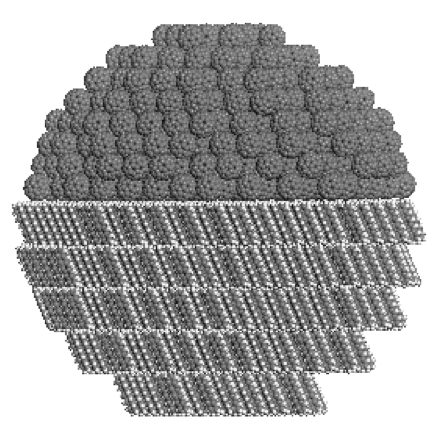 This first work on the Pentacene – Fullerene heterojunction has been realized on a planar (and not realistic) interface. Indeed, in reality, this kind of interface is much more complex, the interface must be in three dimensions with inclusion of pentacene molecules in the bulk of fullerene and vice versa. To determine several possible structures, we will have to perform large-scale molecular dynamics at high temperature on heterojunction. Then with the geometries of the complex heterojunction generated, we will study all the electronic process involved in this kind of system: transport of excitation, charge separation/recombination, and transport of charge. Linares, M.; Beljonne, D. ; Cornil, J.; Lancaster, K.; Brédas, J.L. ; Verlaak, S.; Mityashin, A.; Heremans, P.; Fuchs, A.; Lennartz, C.; Idé, J.; Méreau, R.; Aurel, P.; Ducasse L.; Castet, F. J. Phys. Chem. C 2010, 114, 3215. Verlaak, S.; Beljonne, D.; Cheyns, D.; Rolin, C.; Linares, M.; Castet, F.; Cornil, J.; Heremans, P. Adv. Funct. Mat. 2009, 19, 3809.